We know that Jessicake's favorite activities include frosting cupcakes and decorating cakes, so it seems as though her favorite hobby has inspired her very vibrant hairdo. Isn't it fabulous how her shiny blue hair looks like a scrumptious dollop of sugary icing? It looks good enough to eat! Plus, her large curled ponytail goes boing whenever shes's coming from or going to the Cupcake Queen Cafe. Now your daughter loves Jessicake, and can you blame her? Jessicake is adorable! 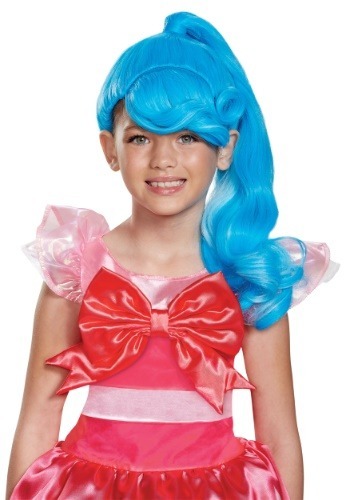 But (luckily) your little girl is a few years away from experimenting with funky hair colors, so if she wants to look like her favorite Shoppie Doll now, this wig is what she needs. Gift her with this adorable Jessicake wig so she can resemble her favorite toy of the moment. Pair this accessory with the coordinating Jessicake costume and your little Shopkins lover will be so elated that she'll insist you come to her room for a celebratory tea party. It will be a delightful memory for both of you!